It’s a tall order: what have they all got in common? Winnie Byanyima, executive director of Oxfam, and a member of the High-Level Panel, said, “This report gets to the heart of the problem with access to medicines – that the intellectual property rules promoted by the pharmaceutical industry are at odds with the human right to health. If implemented the report’s recommendations will go a long way towards ensuring all people have access to affordable quality medicines.” Winnie is, though, confused — at least if the press release is anything to go by. The three examples in that press release are, in fact, linked by having nothing to do with patents, intellectual property or trade rules. The EpiPen is an injector device for people with life-saving allergies that has been at the centre of a media storm in the US. It’s not sold at a hyper-inflated price by a wicked big pharma company but by Mylan, one of those generics companies that has long been the darling of a certain kind of ideological health activist. Mylan, in fact, donated a lot of money to the Clinton Foundation, to support the Foundation’s efforts to get generics companies the right to copy and sell advanced HIV medicines, big business for Mylan. The problem is not that Mylan has a patent on the EpiPen — the product is old and any patents expired long ago. It’s that the product used to be cheap so, competitors were slow to start trying to sell rival versions in the US. As Mylan jacked up prices, would-be competitors (among them a big pharma company) hit various domestic regulatory hurdles. Witty could have added that there were several vaccines in development against Ebola ten years ago but they stalled for two reasons. The most important is that it was impossible to conduct clinical trials because there were no Ebola infections. If no-one was at risk, it was impossible to assess whether a vaccine reduced the risk of contracting Ebola. Even the most publication-driven of the academic vaccine research community could no longer justify running yet more tests on hapless monkeys: the researchers needed at-risk humans. I might have rounded up boy band members or Daily Mail readers, vaccinated half of them and then exposed them all to Ebola. If some of the vaccinated ones had survived, they would finally have done something useful for society. I’m told, though, that this would not be ethical. As soon as there was an Ebola outbreak, the vaccines were rushed, by big pharma companies, into highly ethical and very innovative trials. Two seem to work well. They will probably be licensed soon. The other reason that work on vaccines, diagnostics and therapeutics for Ebola stalled was that funding from state sources slowed in the first decade of this century. It ceased to be a political hot topic so research waned. That’s what happens when politicians decide which health priorities to fund. The US Congress sought to involve the private sector by promising to buy a $1 billion stockpile of vaccines and drugs for Ebola when they had been developed. Sadly, no-one else promised to buy anything. Many African countries continued to fritter away money on subsidised airlines, fuel subsidies and other perks for the élites. The Center for Global Development estimates that Nigeria alone underspends on health by about $11 billion a year. Imagine if some of that had been promised to companies working on Ebola diagnostics. That, of course, is outside the Panel’s remit too. On Zika, the report says, “prior to 2015, Zika was an obscure virus that received little attention from the global community.” There are, in fact, at least three vaccines in development against Zika. One comes from a government-funded programme; two are the products of the pharma industry. All were underway long before 2015. I admit that I didn’t do well in economics but it seems to me that a solution might just be to pay a lot for new, rarely-used antibiotics. Paying a lot for cancer medicines is what turned multiple myeloma from a death sentence to a manageable chronic condition; paying quite a lot is what has given people with HIV a normal life expectancy. Both are bargains because keeping people with those diseases healthy is cheaper than managing their slow deaths in expensive hospitals. According to the US National Institutes of Health, sepsis (the most serious consequence of an uncontrolled infection, usually caused by bacteria) is the most expensive condition treated in U.S. hospitals, costing more than $20 billion in 2011. So, charging a lot for even a short course of medicines to avoid it would, presumably, be fine. Prices that are fine in the US would not be fine in the Central African Republic so there needs to be a way of getting these new antibiotics to properly-qualified doctors in suitable hospitals with access to adequate diagnostics in poor countries. Sadly, given what most poor countries choose to spend on health, this won’t be a big issue. 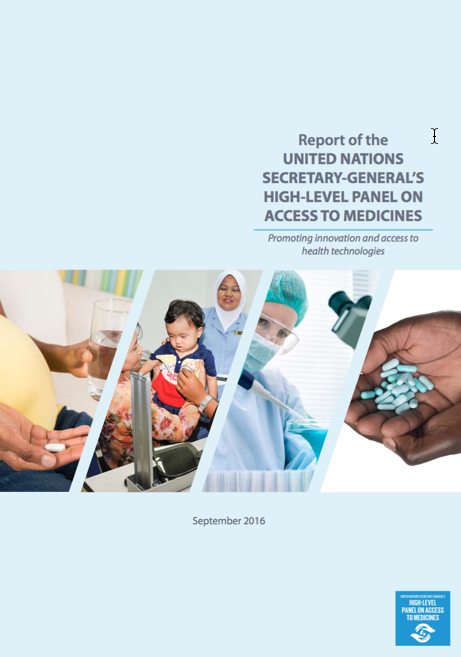 The long-awaited UN report on access to medicines was launched this week. We’ll review it in more detail over the coming weeks. Our sister site, Health Issues India, has a marvellous special section reviewing access issues in India from every perspective. It includes interviews, case studies and features by several of India’s leading journalists.